Editor’s note: This is the fourth installment of Platforms 2018, a series on the policy positions and records of Oregon’s two leading gubernatorial candidates. Oregon’s government never seems to have enough money. Even with the economy purring in 2017, top lawmakers from both parties warned that the state was headed toward painful budget cuts north of $1 billion. The state avoided those cuts, thanks in large part to tax receipts outpacing expectations. But the dire warnings in the best of times illustrated how little control Oregon’s political leaders seem to have over budget growth. Gov. Kate Brown, a Democrat, agrees with her Republican challenger Rep. Knute Buehler that the state has a “structural budget deficit.” However, they are in stark disagreement over the cause. While Buehler says the problem is the state’s failure to curb personnel costs and reprioritize spending, Brown supported a plan two years ago to grow the budget by nearly 30 percent by passing new business taxes. Measure 97, which voters rejected, would have allowed the state to increase education and health care spending without cutting in other areas. Over the past decade, Oregon’s state budget has dipped just once: at the bottom of the Great Recession, it fell 5.5 percent. In every other cycle going back to 2005, state spending has increased by double digits according to the Legislative Fiscal Office. Oregon’s latest budget is up 10.5 percent, after lawmakers from both parties and the governor signed off on a mid-biennium spending plan this year covering everything from wildfire fighting bills to creating Brown’s new Carbon Policy Office. In an interview with The Oregonian/OregonLive, Brown largely avoided saying how she plans to balance the next budget in 2019 and what programs she wants to trim or grow. Voters can find out when she releases the budget in early December, after the election. “You will see specific proposals in my budget,” Brown said. However, the governor signaled she’s again expecting the good economy will solve some of Oregon’s short-term budget challenges. 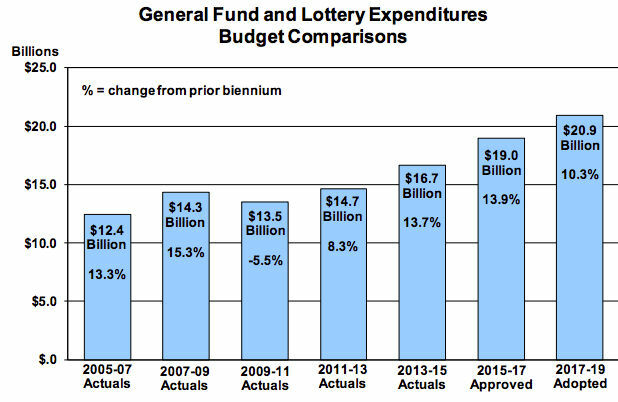 Democratic legislative leaders and Brown’s own budget staff predicted as recently as August the state could face a budget gap of more than $1 billion next year in a general fund and lottery budget of at least $21 billion. “We’re anticipating because the economy is continuing to grow, that means the gap will continue to shrink,” Brown said in August. For his part, Buehler says Oregon should overhaul how it builds budgets by starting at zero and requiring each agency to justify every proposed expenditure. That concept, “zero-based budgeting,” has been popular among national Republicans for years and Chris Dudley, the Republican ex-Blazer who narrowly lost the governor’s race in 2010, also proposed it. “Just because they’ve existed in the past doesn’t mean that their budget is going to exist in the future, or certainly it’s not going to just automatically increase,” Buehler said in an interview in August. Republicans in the Legislature introduced a bill to require zero-based budgeting in 2017; it died without even getting a hearing. Under Oregon’s current budget process, agencies calculate how much money they would need to maintain current programs and services given inflation and other factors. They also propose scenarios for how they could cut their budgets. Buehler and some other lawmakers say this process too easily allows budgets to grow without real examination of whether the spending is serving its original purpose. Buehler also agrees with many business leaders and other Republicans that the state should attempt to significantly rein in its pension costs – he says he’d aim for $1.2 billion in the next budget – before considering legislation to raise taxes. The Republican candidate said he would redirect any pension savings to lengthen the school year and increase career and technical education programs to meet the unfunded mandate voters approved 2016, Measure 98. Brown took an initial step this year toward addressing the $22 billion pension deficit, with a law passed by the Legislature in March. The governor’s plan calls for the state to use certain windfall revenue to pay down the liability and it encourages school districts and other local governments to do the same by offering a small state match. 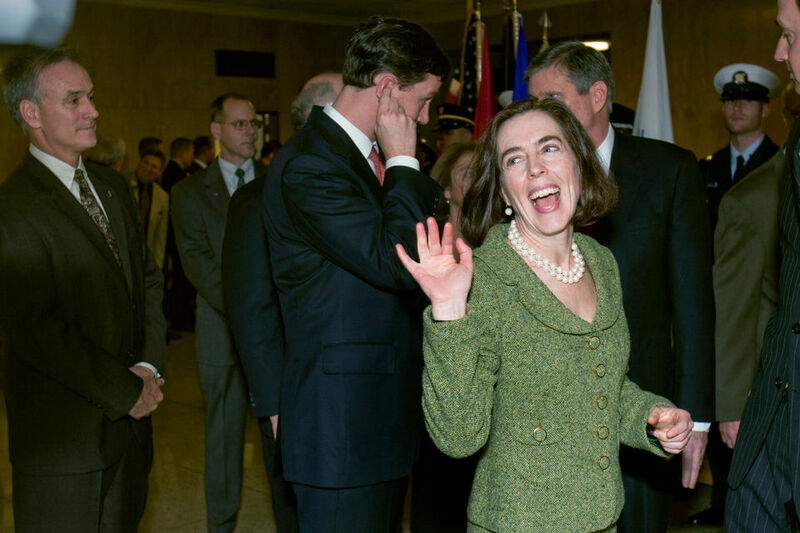 Kate Brown, who was secretary of state at the time, waves at former legislative colleagues in the Capitol. In the midst of the recession, it was the only state budget to decrease over the last decade. Looking ahead to 2019, Brown says she wants to increase spending on affordable housing, homeless shelters and early childhood and K-12 education. However, the governor has refused to say where she’d get the money: budget cuts or tax hikes. Brown’s 2019 agenda, which she’s dubbed “Future Ready Oregon,” entails spending $300 million to fully fund Measure 98. Lawmakers have so far provided only partial funding for the initiative, a strategy Brown suggested in her own 2017 budget proposal. State economists are also predicting the next economic slowdown could hit in the middle of the next budget, in 2020. Brown and Buehler differ significantly in how they would prepare for a recession: Brown said she’s focused on cost savings, while Buehler said he’d push the Legislature to dramatically grow the rainy day fund. 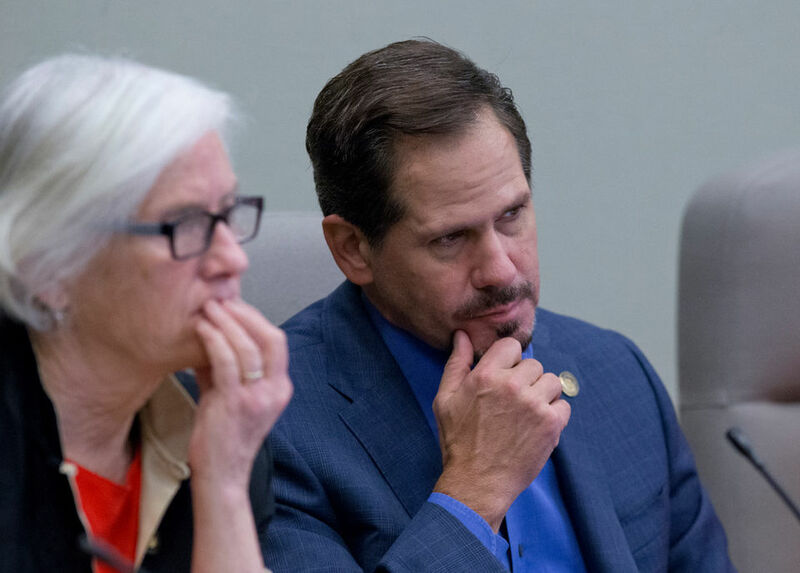 Rep. Knute Buehler listens during a legislative hearing in Salem earlier this year. 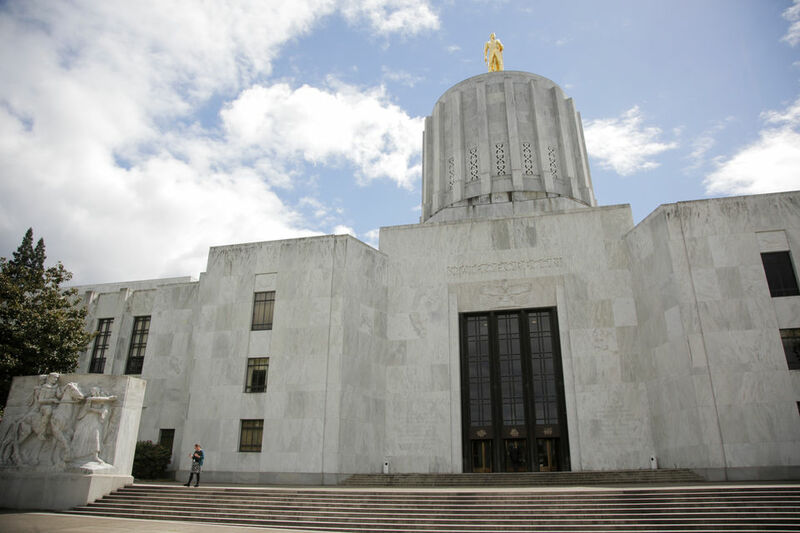 Buehler wants to lift the cap on Oregon’s rainy day fund from 7.5 percent to 20 percent of the budget, so the state would save more money to smooth out ups and downs in the state’s volatile income tax-dependent revenue system. Oregon’s rainy day and education stability funds now total just over $1 billion, which slightly exceeds what economists in the Legislative Revenue Office say the state might need to weather an average recession but is short of the 10 percent reserves the state could need during a severe downturn. Brown said she’s been preparing for a downturn in part by focusing on controlling costs now. “Under my leadership in the last two years, we saved $500 million,” Brown said. In fact, the savings to the state budget are significantly smaller. The Department of Administrative Services says the savings actually total $470 million and of that, more than $60 million was from the federal government and other sources so it wouldn’t affect the state’s bottom line. The agency, which puts together the governor’s budget proposal, declined to identify how much of the savings was federal rather than state money. Other listed savings, such as agencies returning $70 million in unspent monies, are routine although the administrative agency says that figure is higher than usual. Brown’s savings also include money the state avoided spending by leaving government jobs unfilled. That strategy can bring its own problems. State auditors recently found that despite record budgets, Oregon has increasingly left unfilled internal auditor jobs meant to find problems and help government deliver services efficiently.